In late September, 1940, three spies landed on the Banffshire coast in a rubber dinghy. Dropped off by a flying boat from Norway, the two men and one woman would not remain undiscovered for very long. François de Deeker (real name Karl Theodore Drücke) and Vera Eriksen (a.k.a. Vera von Schalburg, Vera von Stein, Vera de Cottani de Chalbur, Vera von Wedel, Vera Staritzky) were apprehended in a local train station. Werner Walti (real name Robert Petter) made it as far as Edinburgh before he too was arrested. Drücke and Petter were virtually unbreakable, even by MI5's expert interrogator Tin-Eye Stephens. They were hanged in early August 1941 at Wandsworth Prison. The story of their accomplice, Vera, is more convoluted. She was never prosecuted, a mystery which has baffled historians for decades. Was it because she was a woman? Because she had given birth to the illegitimate child of a member of upper crust English society? Because she had cooperated with MI5 and become an informer? Because she was working for MI5 from the very beginning? 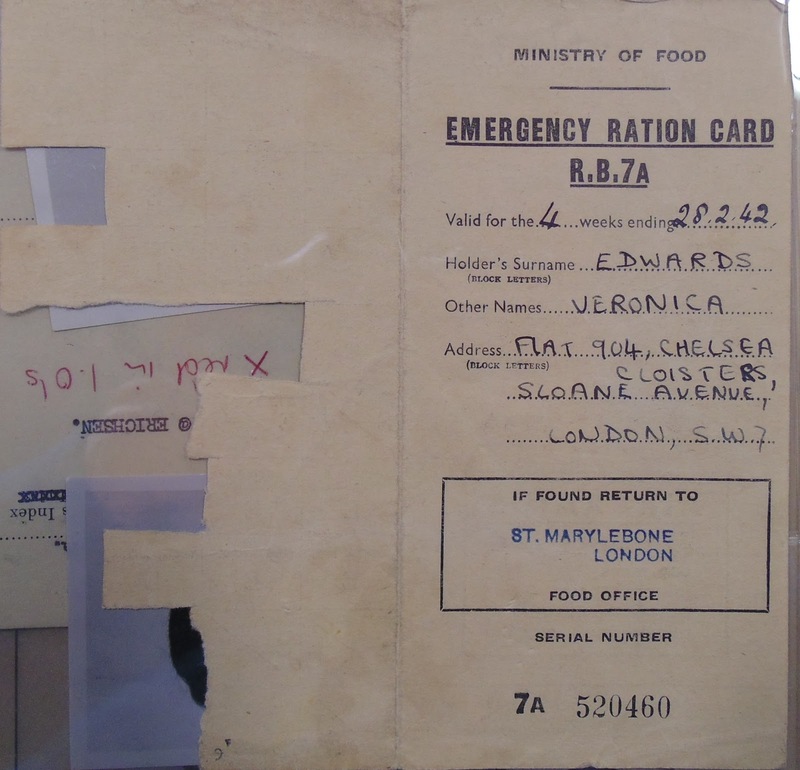 What became of Vera after the war? 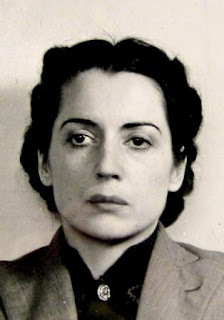 Did she really disappear into post-war Germany without a trace? Or did she live out the rest of her life on the Isle of Man or the Isle of Wight under another name? Although the declassified MI5 files of Drücke, Petter and Vera were released to the National Archives in 1999, they are heavily redacted and much material is missing. There is a note in KV 2/15 which has a list of Vera's passports (legal and illegal) and many of her aliases. She was apparently a complicated woman with a complicated life! 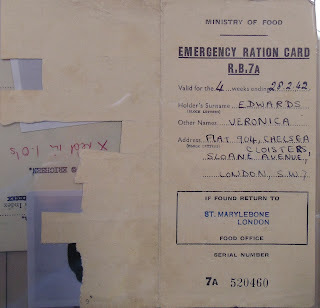 And if that's not enough to confuse matters, Vera was issued with a Ration book by MI5 in the name of Veronica Edwards. At least they kept the initials V.E. presumably while Vera was on MI5 "duty". 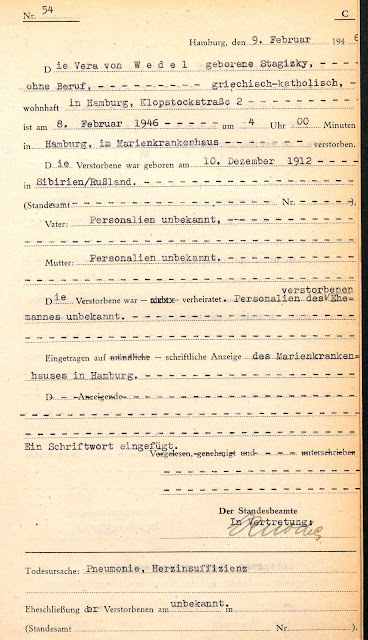 It should also be noted that in 2005, several other Security Service files pertaining to Vera, Drücke and Petter were released to the National Archives: KV 2/1701 to KV 2/1706. It would be interesting to know what is in those files... apparently they pertain to the trial of Drücke and Petter. Might have nothing on Vera. In snooping through the lives of these World War 2 spies, I've come across a few sites that provide helpful information. Vera's story is still very much alive and speculation runs rampant. Port Gordon - a local history site that gives a fairly accurate history of the three spies. Wikipedia - Vera's article with very thin references. Alchetron - interesting site that has a clip of the interview with Helle von Bülow (in Danish), Vera's sister-in-law. Rumour has it that the interviewer has turned out to be "unreliable" so the information should be taken with a grain of salt. Most of the information is simply from Wikipedia. Cilips - the musings of Peter Reid who resides in the old Port Gordon Police Station. Phil Coldham - some fairly comprehensive information on Vera's life from a keen researcher. Kirstine Kloster Andersen - a Danish writer who is also pursuing the story of Vera. Her theory is that Vera passed away shortly after her return to Germany. (The link is know a dead link. Too bad.). Hilmar Dierks - finally, the site (in German) of one of the grandsons of Hilmar Dierks, head of the Hamburg Abwehr office. Rumour has it that Hilmar and Vera had been lovers or even married. The site hasn't been updated since 2005 but has an interesting handwritten letter (in English) to Michael Dierks (the grandson) from Ragna Schalburg, apparently an in-law of Vera. 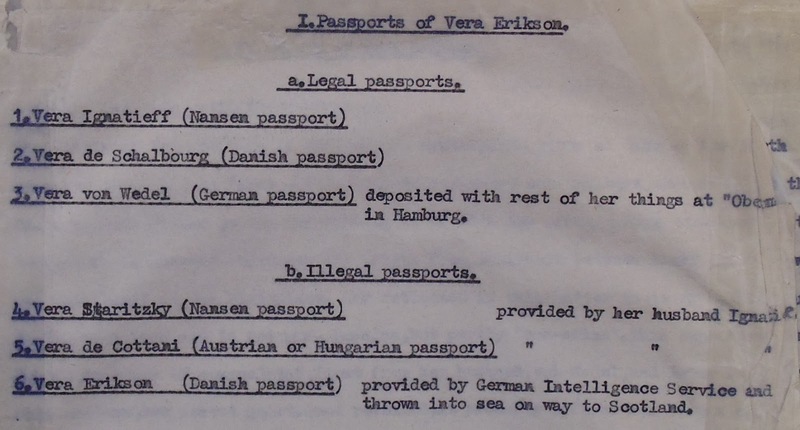 Dierks' theory is that Vera did return to Germany and a death certificate for the Vera von Wedel was issued so that she could then return to England to begin her new life. Nifty theory in that it covers all the bases. "You're wondering what happened to Vera, "the Beautiful Spy" as we called her. Well, you're absolutely right. She came over to us. If you ever want to see her again, well, I should have a look around the Isle of Wight. I think you might find her there--with another name, of course, and nobody there has the slightest idea of her background." What happened to Vera? Who knows. It's a mystery and we humans tend to love mysteries. So people will keep digging. Did she die in Germany? Did she die in England? The Hilmar Dierks website noted that some English hobbyist researchers had speculated that the death of Hilmar Dierks in a car accident shortly before Vera and crew left for England was faked so that Dierks and Vera could live happily ever after in England. Apparently there was a C.H. Dierks who moved to England 1903 and lived in Wales. He married a woman named Mary Elizabeth who passed away in 1993. Is this where the 1993 death date for Vera came from? Michael Dierks is pretty certain that this C.H. Dierks was not the same person as his grandfather. Beyond that... things are a mystery. As for Vera passing away in Hamburg. Everyone mentions a death certificate with her name on it... and lo and behold, it is available on Ancestry.co.uk. Here it is. I'm also including a link to a version via Dropbox since the resolution isn't great here. died on 8 February 1946 at 4:00 (a.m.) in Hamburg at Marien(hospital). The deceased was born on 10 December 1912 in Siberia/Russia. The deceased was married. Husband deceased and unknown. Cause of Death - Pneumonia and weak heart (insufficient heart). Marriage of the deceased - unknown. Was it Vera? Hard to say. 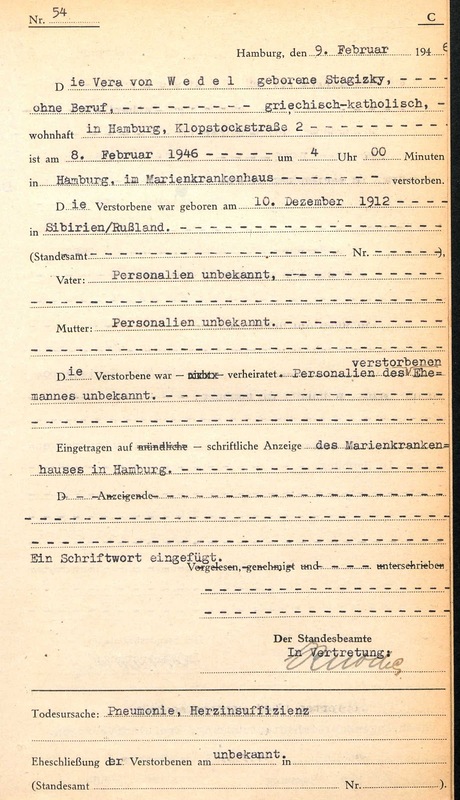 Kind of convenient that the address where she was living was the place where the Abwehr trained their spies during 1940 and 1941 - the Klopstock Pension at Klopstockstrasse 2. According to the Dierks website, the street is now called Walburgstrasse and is near the old city. The current location of "Klopstockstrasse" in Hamburg is quite a ways from the old city. Given that Hamburg sustained heavy bomb damage during the war, it makes sense that the old locations do not quite match up with current street names. 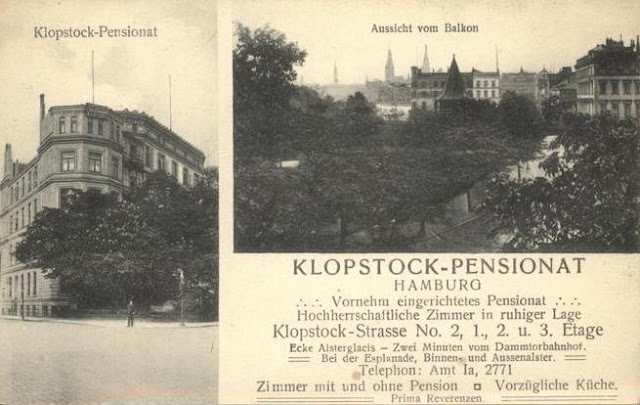 The postcard for the Klopstock Pension notes that it is on the corner of Alsterglacis and 2 minutes from the Dammtorbahnhof. This jives with the Dierks website. destined for England in 1940/41. And... before I go too far down this road... I'll stop here. Clearly. this is leading to another post about Abwehr sites in Hamburg!! Very interesting. It is good to know that somebody is seriously researching Vera's life. I have good reason to believe that she died in 1978 in Lancashire, after having worked for MI6 post-war. I'd like to see any evidence of her time spent on the Isle of Man, and also of her rumoured death in 1993 on the Isle of Wight. So far, I am not convinced. Thanks for this tip. A friend of mine is writing a book on Vera - stay tuned and I'll review it when it gets published.